Roofing your house rarely rates high on the list of fun and exciting home remodeling projects. But when your home develops a leak, your attitude might take a sharp turn. Suddenly, the prospect of a dry, tightly-sealed house begins to look very attractive. There are many types of roofing materials to choose from, and a little bit of investigation might lead you to consider a new type of roofing rather than simply replacing with the same material you now have. Choosing the right roofing material requires that you weigh appearance, longevity, cost, and structural issues. Here are 12 possibilities to consider when it comes time to replace your roof. Rolled roofing material is the mainstay of low-slope residential roofs as well as out-buildings like shops and sheds and other utilitarian structures. Rolled roofing consists of long rolls of mineral-impregnated asphalt-impregnated material topped with mineral granules. Each roll is about 100 square feet of roofing, about 3 feet wide. These large-format strips of thin roofing material offer a fast, convenient, and inexpensive way to cover a sloped-roof building like a workshop where appearances aren't important. Rolled roofing can be applied either with the torch-down method or with roofing nails. Rolled roofing is relatively inexpensive, costing $1.50 to $2.50 per square foot, installed. Rolled roofing lasts, on average, about 10 years before it needs to be replaced. Built-up roofing (BUR) is one of the oldest options for roofs that are flat or very low in pitch. BUR systems are constructed with several layers of roofing felt impregnatd with asphalt that is applied hot. The felt is applied in overlapping layers to form a barrier two to four layers thick, then a layer of finely crushed stone is embedded in hot tar over the top to create a very durable and impenetrable roof. BUR roofs typically cost $2.50 to $5.00 per square foot, installed. Industry surveys show that a properly installed BUR roof can last 20 to 30 years. 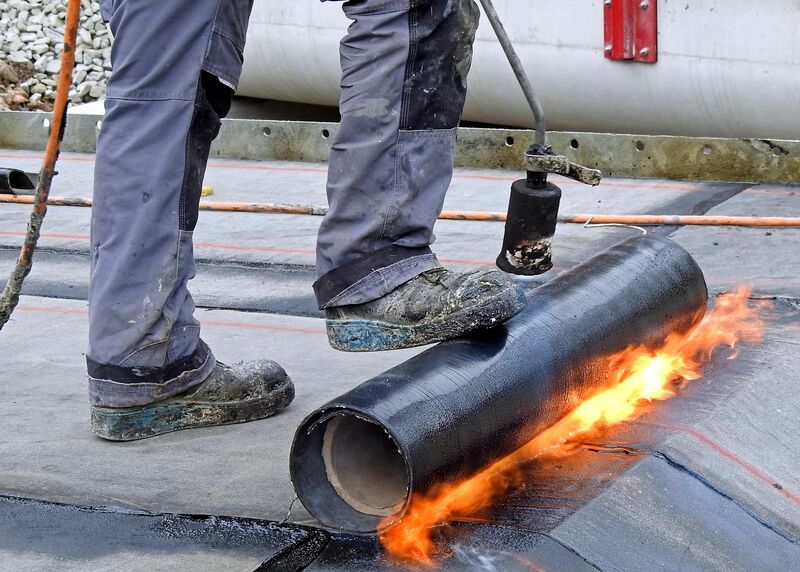 One of the best membranes is EPDM. EPDM is a synthetic roofing material often referred to as "rubber roofing." It is similar to rolled asphalt roofing in that it is applied in large sheets that limit the number of seams where water can infiltrate. Costs for a membrane roof range from $3 to $4 per square foot, installed. Lifespan is typically 20 to 35 years when the roof is properly maintained. Asphalt composite shingles are the most popular roofing material in North America. Made from a fiberglass base topped with asphalt and mineral granules, these three-tab shingles are an all-around good choice for most home roofing needs. They typically come with a 20- to 30-year warranty, and replacing individual shingles that are damaged is a fairly easy job. Virtually every roofing company is familiar with installing these singles.Composite shingles excel at flexing and adapting to a roof's movements due to expansion and contraction. Costs range from $1.50 to $3.50 per square foot, installed. Depending on the quality of the shingles and the conditions, the lifespan of the roof can range from 12 to 30 years. The most common type of metal roof is the standing seam roof, so named because the aluminum or steel roofing panels meet in raised seams that interlock to keep moisture out. Metal roofs of all kinds are increasingly popular in regions with heavy snowfall or where there is a notable danger of wild fires since this is a roofing material that is fully fireproof. Metal roofs are very long-lived and are fully recyclable when they finally do wear out. But installation requires special skills and not every roofing company is prepared to install a standing seam metal roof. Costs typically run from $6 to $12 per square foot, installed. Metal roofs commonly last 30 to 50 years, but some have been known to last 75 years. For homeowners who do not like the look of standing seam metal roofs but want the advantages of metal, there are steel or aluminum shingles or shakes now available. Made from stamped metal and finished with either a high-quality baked-on coating or mineral granules, metal shingles can be fabricated to look very much like traditional asphalt shingles, wooden shakes, or even slate or clay tiles. They are an excellent choice where appearance is a critical concern. Metal shingle roofs typically cost $7 to $10 per square foot, installed. They can last 30 to 50 years. Wood roofs are very attractive, but they are also quite expensive and have limitations. They are not particularly long-lived, and they are a poor choice in areas that get lots of moisture or where wildfires are a danger. Still, they are among the most attractive of all roofing materials, which makes them a popular choice for luxury homes. Although both are made from natural wood, usually cedar or redwood, there is a difference between wood shakes and shingles. Shingles are typically thin, wedge-shaped slabs of wood that are produced by precise sawing. Shakes are produced by splitting and are thicker wedges with a rougher texture. Shingles typically cost about $4.50 to $9.00 per square foot, installed; shakes are more expensive, with average costs of $6.50 to $11 per square foot, installed. Longevity depends very much on circumstances and maintenance. In relatively dry climates, and wood shingle or shake roof can last 60 years; in damp conditions, you may only get 20 years from the roof. Clay tile is made from earthen clays molded into rolled or interlocking shapes and fired for hardness. It is often left unglazed, with the characteristic reddish-orange color; or it can be glazed and fired to form ceramic roofing tiles. Clay tile is a very good roofing material for hot climates or where salt air is present, which is why these roofs are seen so often in southern coastal regions or desert regions. Tile is an expensive roofing material, with costs that can range from $10 to $18 per square foot, installed, though more exotic ceramic tiles can run as much as $30 per square foot, installed. Clay tile is a very long lasting roofing material that can last more than a century. Concrete tile is an alternative to clay tile, with similar installation techniques and similar advantages. Concrete tiles are molded from standard sand-mix concrete colored to whatever hues are desired. A variety of profiles are available, some of which resemble rolled clay tiles, others that are low-profile resembling wood shakes. Concrete tile is sometimes finished with a decorative coating. It is a very heavy roofing material, making it a good choice in high-wind regions. Costs are about one-third less than clay tile—typically about $9 to $12 per square foot. Life expectancy is 50 years or longer. A slate roof is perhaps the finest roofing material there is—a choice for the homeowner who will accept only the finest. There are slate roofs hundreds of years old that are still functioning. True slate roofing is just as it sounds: authentic, thin sheets of real stone. Because slate has a tendency to cleave off in thin sheets, it is easy to quarry, making it ideal for roofing. But installing slate is a very specialized skill, and qualified installers can be hard to find. Slate roofs typically cost $30 to $75 per square foot, installed. But it is very likely the only roofing you will ever install—a slate tile roof often lasts 75 to 200 years. Synthetic slate shingles are a surprisingly convincing stand-in for natural slate, but this material is constructed from engineered polymers combined with recycled plastic and rubber. From the ground, it can be virtually impossible to distinguish this engineered roofing from natural slate. And synthetic slate is quite lightweight, making it a viable option for houses that cannot support the heavy weight of natural slate. Synthetic slate roofing typically costs $6 to $12, installed. Although not as durable as true stone, synthetic slate usually comes with a very good warranty—up to 50 years. Moss is usually regarded as a bad sign on your roof, but when properly planned for, moss and other living plant materials provide an effective roofing material that gives back to the earth. A truly unorthodox type of roof, the green or living roof nevertheless holds much promise. It can put oxygen back in the air, provide thermal insulation to your house, absorb rainwater, and even allow you to grow plants. To create a green roof, you first install a layer of waterproof membrane and provide adequate drainage. A green roof can be "intensive," meaning capable of supporting large plants and people; or "extensive," which means that it is thin and intended only for light-weight growth such as moss. Costs for a green roof vary widely, but this is definitely a roof for those willing to spend money to make an environmental statement. Such roofs will also require regular maintenance to keep them lasting a long time.